The Red Lake is one of the most beautiful and emblematic lake of the Szeklerland situated at 938 meters above sea level in the central region of the Hăşmaş mountain range. The lake was formed in the summer of the year 1838 when the conglomerated mass of debris at the foot of the Ghilcoş mountain slipped and led to the closing of the valley. The natural dam closed the ways of the creeks and helped the water to accumulate. 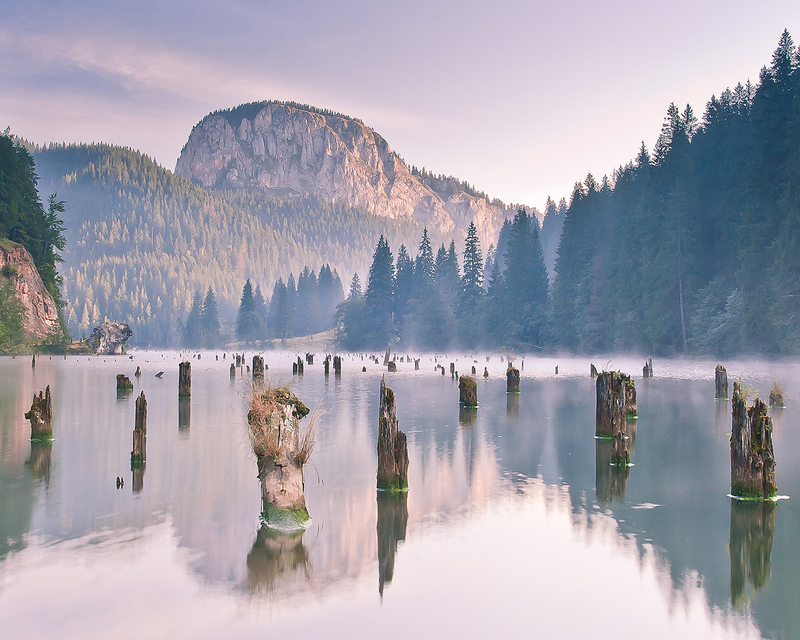 The trunks of the flooded forest and the rockwalls of the Suhardul Mic mountain are part of the fascinating landscape of the lake. About its formation there are several legends told by father to son. Orbán Balázs, who during his travellings wrote legends about Szeklerland, doesn't mention myths about the Red Lake. Urmánczy Nándor wrote for the first time in his itineraries about the legend, in which he memoralises a story told by an old Szekler man. According to the legend an outlaw, who used a cave of Suhardul Mare massif as hiding spot. He then stole the beautiful Ferenc Anikó from a fair in Ditrău and dragged her along to his hideout. The girl begged and implored the help of the cave ghost to set her free, when the walls of the cave opened and she escaped. When the robber came around, he banged the cliff with his bludgeon so powerfully that the mountain collapsed and closed the valley burying the outlaw. In the course of the years several variants of the legend appeared. The popular belief connects the "killing" and the "red " adjectives with the legend, whereas the collapsing mountain burried the grazing herd together with its shepherd, the blood oozed up and painted the lake water red for a long time.